As much as we want our PowerPoint presentations to be flashy in order to fully attract the attention of our audience, there are also times when being too flashy is somewhat inappropriate. For example, when conducting a business-related presentation to an audience of entrepreneurs, you wouldn’t want to show them something that’s overly creative or else your presentation may end up informal. The theme for PowerPoint presentations should fit appropriately to the type of discussion being conducted as well as the audience in attendance. But just to be safe, you can always go with minimalism. The great thing about minimalist themes is that they are very good at blending in and that they can be used with virtually any occasion. The same thing can actually be said with minimalist or simple PowerPoint presentations, they do well regardless of the type of discussion. 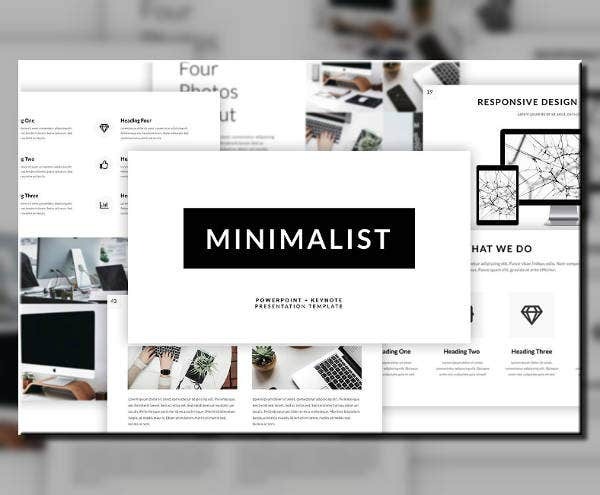 Minimalist PowerPoint presentations are highly straightforward and will really encourage the audience to focus on the more important aspects of the topic. 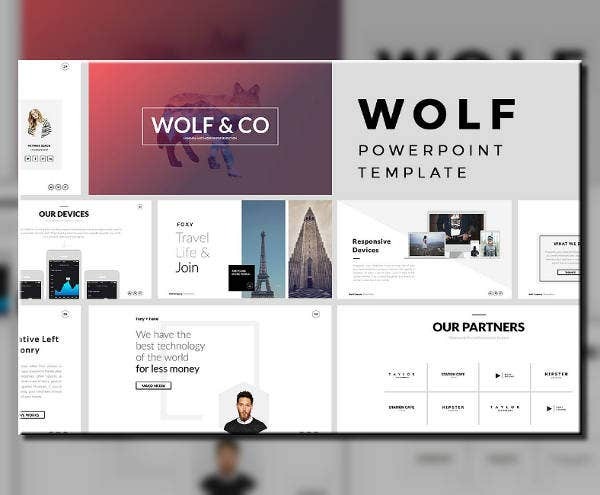 If this is the type of theme that you need for your presentation, then feel free to check out our collection of PowerPoint templates below. 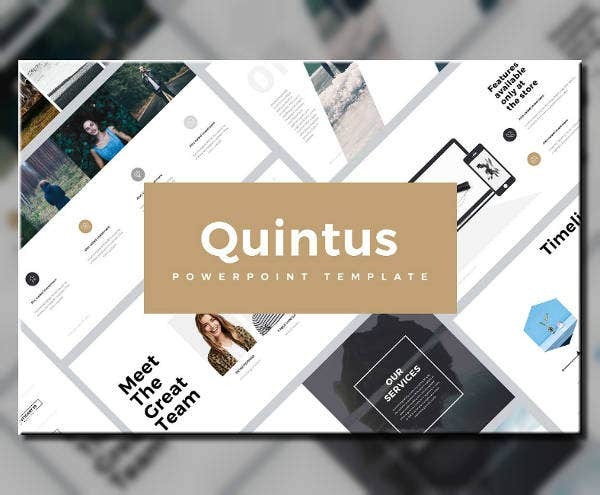 Let’s start the ball rolling with this simple yet eye-catching professional PowerPoint template. For as low as $12.00, you will already be getting tons of great features including four color schemes, an editable graphic chart, and custom animations. 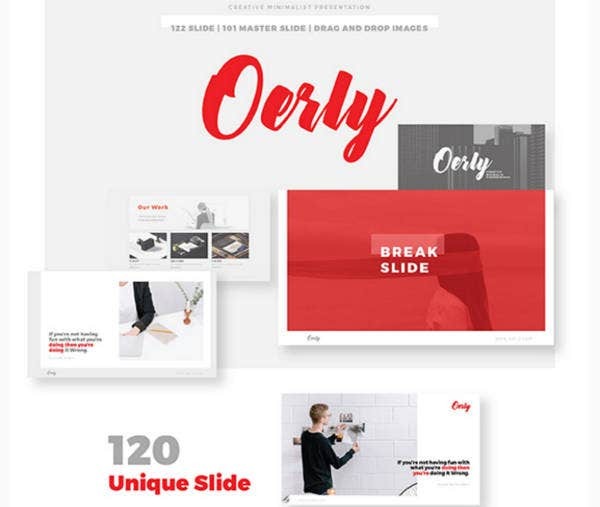 If you feel like going red and white on your PowerPoint presentations, then Oerly PPT template may be the ideal choice. 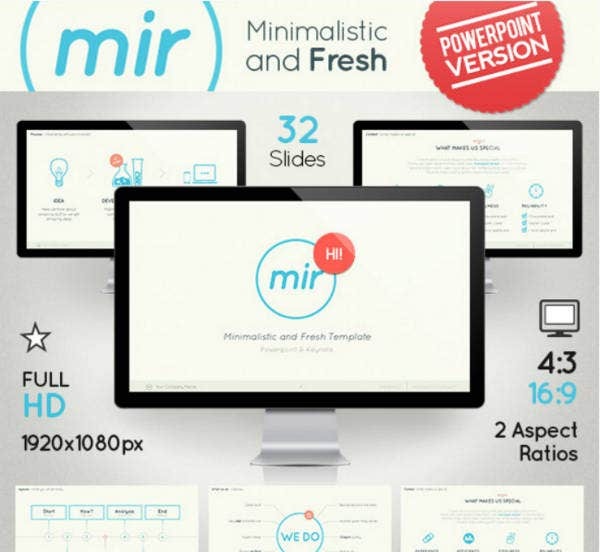 This template has over a hundred awesomely-designed slides, over 250 vector icons, and tons of device mockups to allow you to see how the presentation may look on various devices, and all this you can download for only $15.00. 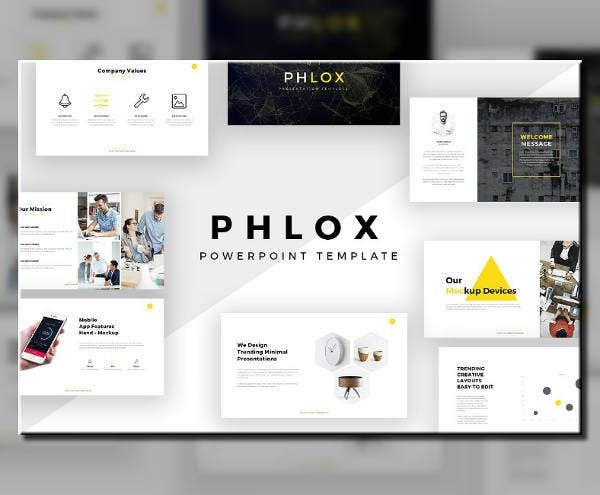 Even with a simple design, make your PowerPoint presentation look professional with Phlox PowerPoint template. 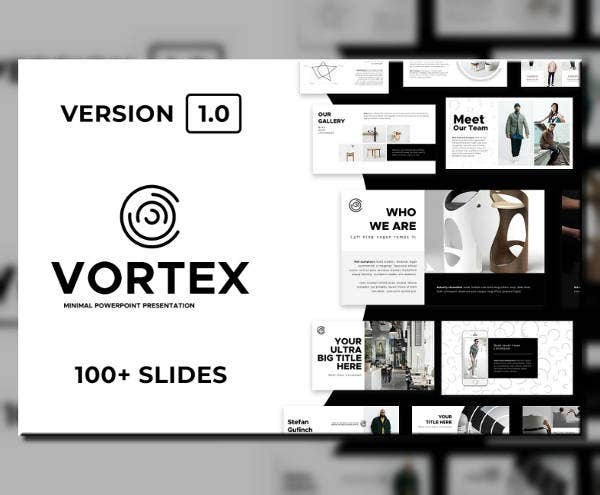 This cool PowerPoint template allows you to easily drag and drop graphical elements on to the slide, and you can choose from over 450 vector graphics. 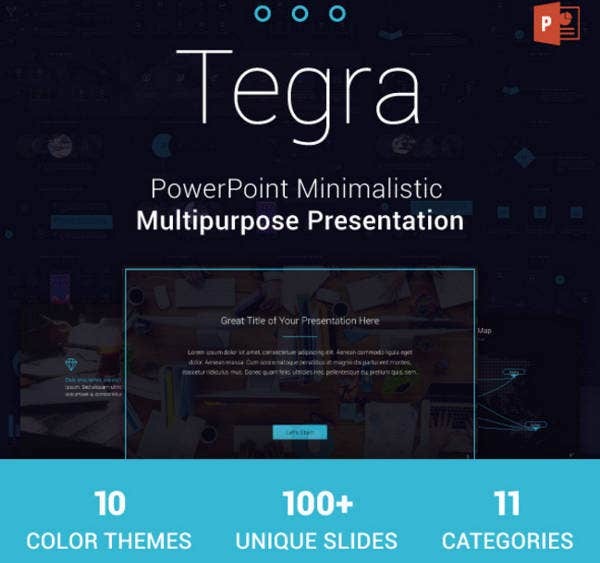 How to Make a PowerPoint Presentation? 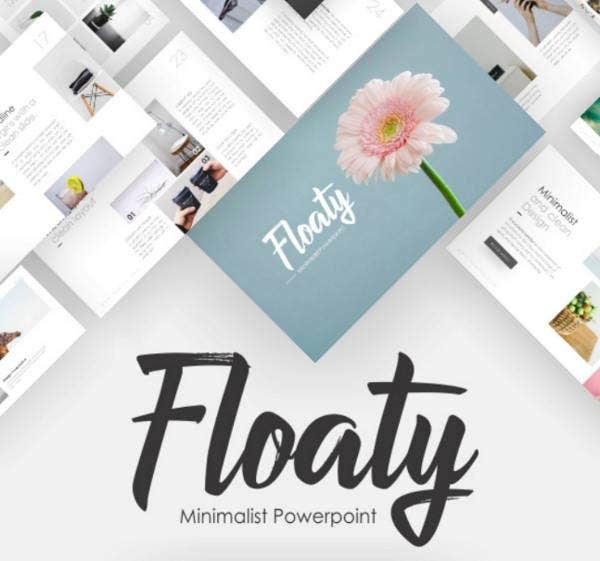 Making a PowerPoint presentation is actually not that hard, it simply involves a few dragging and dropping of images or illustrations, inputting of text, and enhancing the presentation through transition effects. Once you know the basics of it, you will easily get the hang of it. But if you haven’t experienced making one, then we’re here to shed some light on the basics of making a PowerPoint presentation. You may also see prezi powerpoint templates. 1. 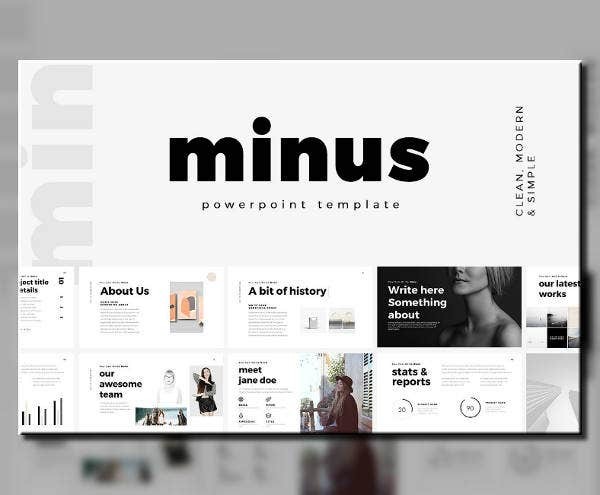 The first and foremost thing that you will need to do after opening Microsoft PowerPoint is to choose whether to start off fresh, use a template, or simply edit a previously made presentation. If you want to get the most freedom from your presentation, then you may go with making a new, Blank Presentation. Otherwise, you might want to use PowerPoint templates in a word to save you a lot of time and effort. 2. Depending on your previous choice, the next thing that you will need to do is to format the slides. For this, you can choose either to have the format applied to all slides, or you can also format the slides individually. To apply a formatting from a template, you can simply click on the Design tab, but if you chose to individual formatting, click on a specific slide, make the changes from the Design tab, and choose to Apply to Selected Slides. 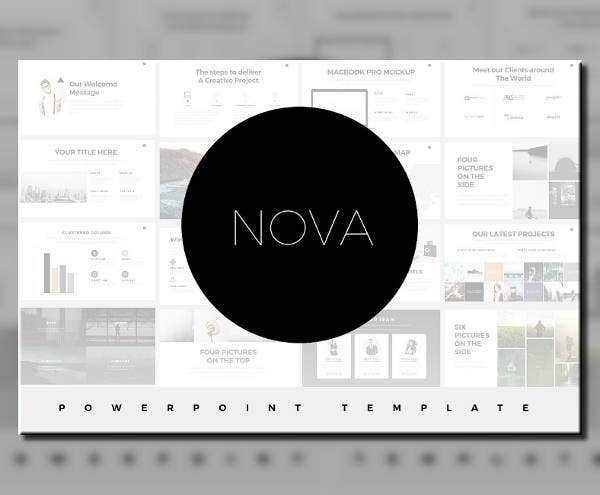 You may also see powerpoint template for Mac. 3. Once you’re already adding slides to the presentation, you will be presented with blank fields where you can add texts. You actually don’t necessarily need to fill out all these fields, you can leave the others blank if you want to. If you want to add some graphics to the slide, simply click on Insert, and highlight Picture to bring out another drop-down menu, then choose From File. You may also see medical powerpoint templates. 4. Take note that you can add multiple slides into a single presentation, so avoid cramping up a single slide with too many elements. If you start running out of space on one slide, add another one and continue from there. If this presentation is intended for a large number of audience, make sure that the text is big enough to be seen even at a distance. You may also see fun powerpoint templates. 5. If you want to incorporate some subtle enhancements in the way your presentation moves from one slide to another, you can apply transition effects to it. To do this, click on the slide that you want your transition to be added, click on the Slide Show tab, then choose Slide Transitions. You will then be made to choose from among various transition effects, you can only choose one from among these options. After making your choice, click Apply. You may also see education powerpoint templates. 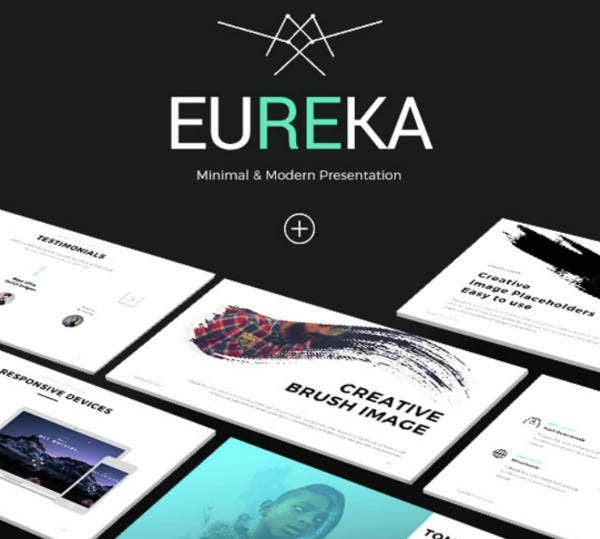 With Eureka sample PowerPoint template, you’ll come to realize that everything you need to make impressive PowerPoint presentations are all here. Indeed, you’ll end up shouting “EUREKA!” if you choose to go with this template. Now that you know the basics of creating a PowerPoint presentation, it’s now time to learn how to enhance these presentations by applying a few tricks. Below are some tips and tricks on how you can make your PowerPoint presentation professional-like to impress your audience and really get their attention. You may also see best business powerpoint templates. The workable space provided for you on PowerPoint can actually be changed if you think it’s not the right size for your elements. The default aspect ratio is 4:3, but you can make it 16:9 if you want to. To change the size, open File, go to Page Setup, specify the height and width, and click OK. You may also see best powerpoint templates. Let’s say after learning the basics of making PowerPoint presentations and using templates, you eventually decide to make your own template based on the ones that you have previously used. This is actually possible, and you can do it by selecting the Themes tab, going to Edit Master, and clicking on Slide Master. Once there, modify the template according to your preferences, and after you’re done, simply close this window. 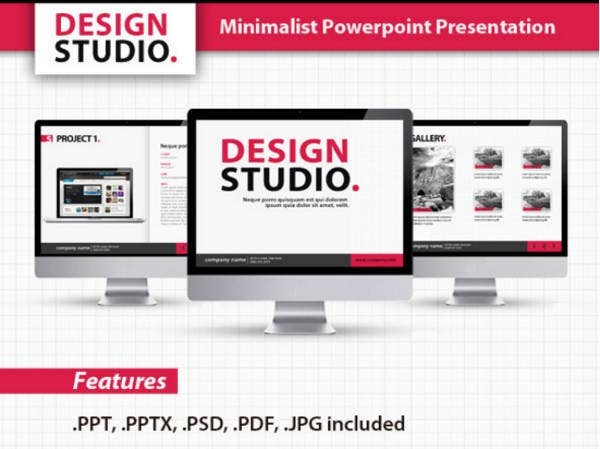 You may also see free powerpoint templates. Ever since PowerPoint 2013, image formatting has become a whole lot easier to do. To format an image, you will simply need to right-click on an image and choose Format Picture. A pop-up bar will then appear on the right-hand side of the screen when tons of formatting options can be found. Play around with these options and see which ones work well for your presentation. You may also see social media powerpoint templates. The title of your presentation should stand out, and it should also provide your audience with an overview of the topic. The process for doing this is almost as similar as with formatting images, simply right-click on the selected text and click on Format Text Effects. There are a lot of formatting options that you can choose from on the right-hand panel, experiment on them to come up with something that works for you. 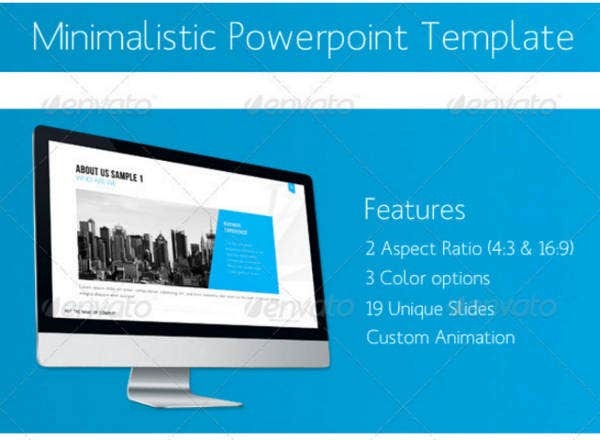 You may also see free powerpoint templates. In PowerPoint, there are already numerous preset animations that you can choose from, but if these presets don’t really fit your style, then you are always welcome to customize them. To do this, go to the Animation tab and look for the Custom Path. Once there, you’ll be asked to draw your own animation, which is somewhat tricky, but also easy to learn. After creating your animation, you can preview it first before actually applying it. 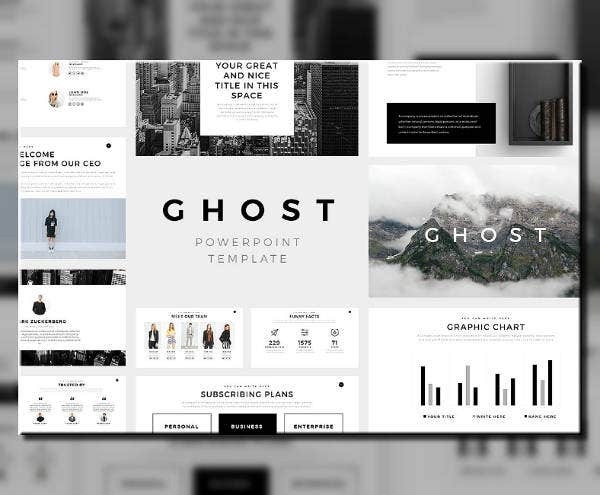 You may also see business plan powerpoint templates. 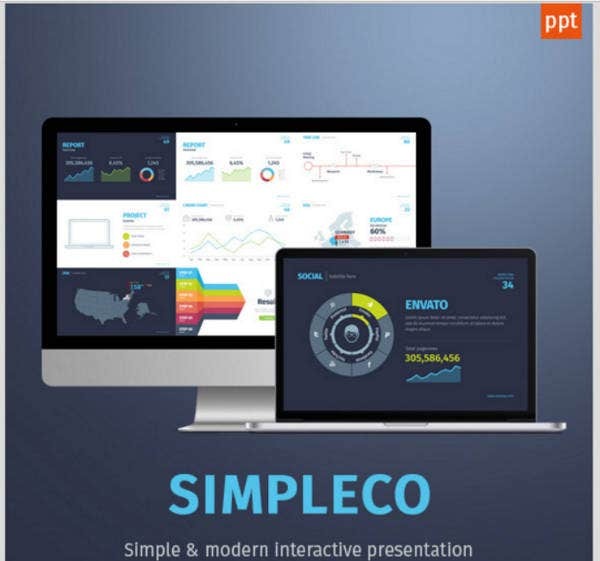 If you choose to go for something colorful, then maybe Simpleco PowerPoint template is the perfect one for you. 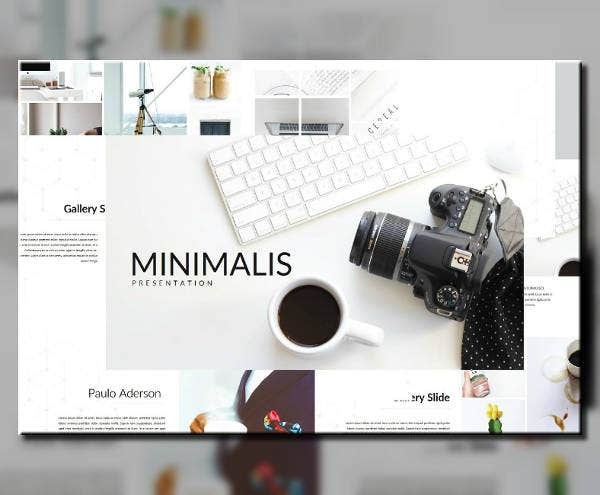 This template utilizes various colors in order to make the elements easily distinguishable. However, there are only two color schemes that you can choose from in this template. Although the use of PowerPoint has indeed helped us a lot with regards to creating beautiful presentations as well as bringing forth useful knowledge in a manner that is worth paying attention to, there are also other advantages that we have benefited from the use of Microsoft PowerPoint. What are those advantages? Check out the list below. Presentations can be created very easily with the use of PowerPoint, it doesn’t require you to have graphic design skills in order to make them. If you have a good eye for designs and you know how to put into consideration the number of the attending audience, you’ll have nothing to worry about your presentation. You may also see family feud powerpoint templates. PowerPoint presentations are able to keep audiences engaged and attentive because of the anticipation for the next slide, and this is something that makes it more superior than regular presentations. You may also see chalkboard powerpoint templates. Using PowerPoint encourages its users to get as creative as they want without having to worry about the overall outcome. The reason for that is because PowerPoint presentations are highly versatile and are very easy to edit if errors are detected during the preview. You may also see powerpoint storyboard templates. With the latest versions of PowerPoint, content sharing has been made a lot easier if you decide to publish your presentation on the internet. You will simply need to convert the file format to something that’s compatible, and you may even be able to add some commentary on the presentation. You may also see wedding powerpoint templates. Also, the recent versions of PowerPoint took advantage of cross-platform collaboration to allow people to work together on a single presentation regardless of their OS or device. Here, collaborators can write comments or notes for other team members to view which makes it a lot more convenient. You may also see jeopardy powerpoint templates.